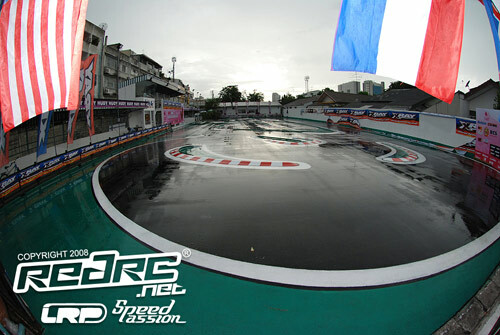 So the stage is set for the 2008 IFMAR Electric Onroad World Championship here at the Radio Control Speedway in Bangkok, Thailand where there is great anticipation for what should be two thrilling World title battles. The first title up for grabs is 1:12th which kicks off tomorrow (Sunday) with free practice. One thing for certain is no matter what the outcome there will be a brand new champion of the world as defending Champion David Spashett has not made the trip to Asia to defend his title and although five times World Champion Masami Hirosaka is here, he will not race, opting to fully focus his attention on trying to lift his first ever 1:10 Touring Car title later in the week. Despite two of the greats of 1:12 scale racing missing from the entry, the battle will be no less intensive with some of the sports biggest names out to add the 1:12 title to their CV. Defending touring car champion Andy Moore, Atsushi Hara & Marc Rheinard head a very strong Hot Bodies team. 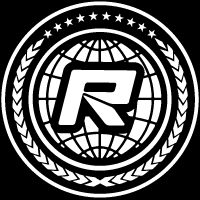 Hara, who proved himself as one of the sports great all round drivers when he lifted 1:8 Off Road World title earlier this year, has conducted hours of testing here at the RCS track, mainly focusing on finding the perfect tyre. Yesterday the team spent the day at the track gluing that ‘perfect’ tyre which many say is going to make it just a matter of whether it is Hara or Moore that takes the title come Tuesday. While Hot Bodies are confident, the line-up from their rivals cannot be overlooked. Back to back Japanese National Champion Naoto Matsukura is certain to be a force with his Associated with Hara rating his 14-year-old fellow countyman very highly. CRC have a capable line-up in current IIC Champion Hupo Honigl and Jilles Groskamp, while former two time European Champion Simo Ahoniemi heads the hopes of defending World Champion manufacturer Corally. Associated have a mixture of experience and youth with top US racer Rick Hohwart joined by young Finnish hopefuls Juho Levänen and Christer Andersson, the latter making his 1:12 debut here. New to the 1:12 ranks, Xray are an unknown but the Slovak company doesn’t do things by half and with the likes of Teemu Leino, Paul Lemeiux and Alex Hagberg driving the new XII they could pose a threat. The team have conducted pre event testing of the prototype car at the RCS, after which it is understood a number of design changes had to be made. We will have to wait till tomorrow to get an early indication of how the newcomer stacks up. 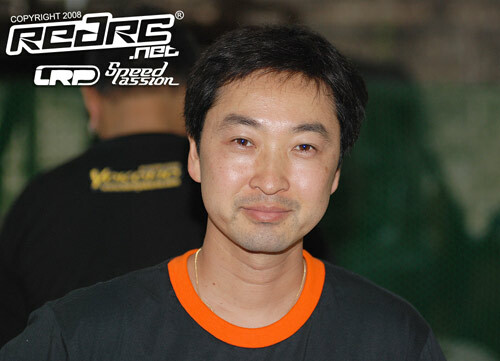 Directing the proceedings for the next eight days here in Thailand is Scotty Ernst who we asked to predict the outcome of the 14th edition of the 1:12 Worlds. The legendary American race announcer thinks Hara and Moore are starting with a distinct advantage thanks to their tyres but believes Matsukura, Hideo Kitazawa and Hagberg could join the Hot Bodies duo on the podium. Having announced at the TITC race here previously, Ernst said the narrow track will produce good racing but feels rain will come into play during the championships. Right now (16:45 local time) we are experiencing very heavy rain at the track! The first cars are due to hit the track at 09:00 tomorrow (Sunday) morning with three free practice runs of ten minutes followed by two controlled practice sessions. 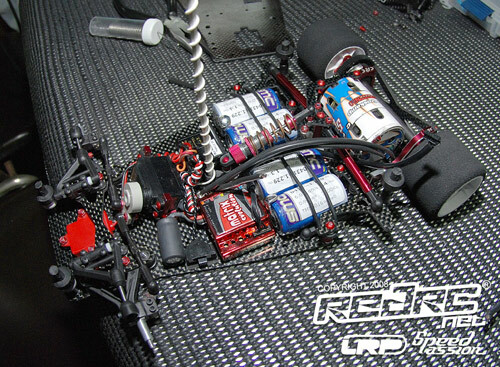 As part of our live coverage, which is supported by Speed Passion and LRP, we will be bringing you regular updates throughout the day with all the news and views of the drivers on Day 1 of the 2008 IFMAR ISTC Electric Onroad World Championships.